For a residential complex in a premium Sydney area, maintenance of the public area is something that needs to be considered. 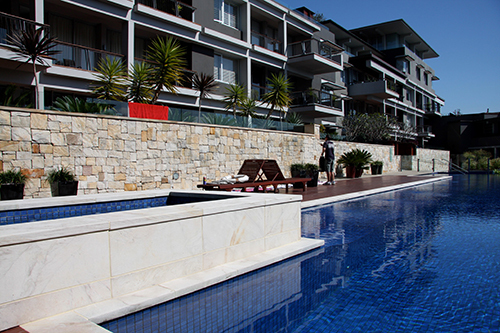 The client wanted to make sure that the sandstone surfaces in the property are easier to maintain. Simon Bailey from Bailey Trade Services was then given the task to seal 640 sqm (approx. 6400 sq. ft.) of sandstone external walls, and around the pool. View the full case study on our website. Click here to download a PDF. Our case study page is one of the most visited on our website. Every case study we publish is permanently located there. If you would like to promote your company with a job that you have recently completed using a product from the Dry-Treat range, email marketing@drytreat.com with your name and phone number. Please put 'case study' in the subject line. Include a description of the project with some great quality images. 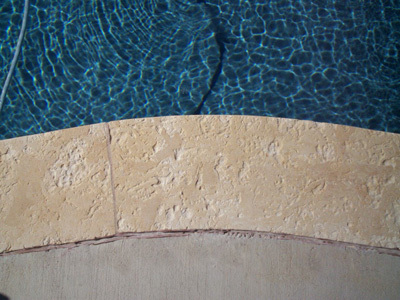 Imagine, you've installed travertine around you or your client's beautiful new saltwater pool and you're very proud of your work. However, 5 months later your travertine is full of pits and starts to flake. What did you do wrong? One common problem with natural stone to be on the lookout for is salt spalling. Natural stone has millions of interconnected pores which absorb water and dissolved salts and minerals. The softer the natural stone, the more at risk it is for spalling. When water evaporates it leaves salt crystals behind below the surface. When these crystals grow close enough to the surface, they break off microscopic pieces of the material. This allows more water ingress accelerating the spalling over time until the stone is visibly damaged. A recent article in the National Association of Home Builders journal, Eye on Housing, reported that they found a connection linking the geographical location of new homes built in 2014 and their likelihood of building a patio vs a deck. According to data from the Census Bureau's Survey of Construction (SOC), numbers show a "clear geographic pattern to the exterior amenities (patios and decks) included in new homes". The SOC data was compiled by dividing the US into the nine census divisions as seen in the below map. 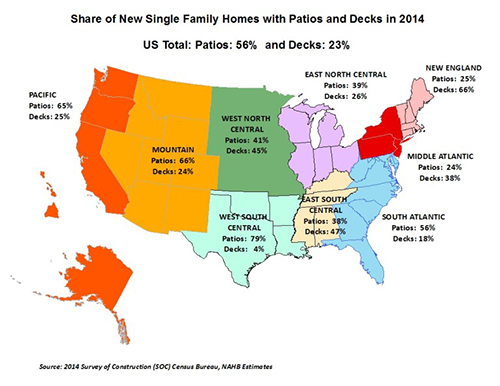 Patios were the most popular overall beating decks 56% to 23%. The division with the highest percentage of patios was West South Central with 79% patios and only 4% decks. On the contrary, New England had the highest percentage of decks with 66%. Don’t worry New England, Dry-Treat has a full suite of products that can help you maintain the natural stone patio of your dreams and protect it from the harsh winters. Visit www.drytreat.com to learn more. Sandstone is a sedimentary rock composed of sand-sized mineral, rock, or organic material containing a cementing material that binds the sand grains together. Sandstones are clastic in origin, meaning that they are denoting rocks composed of broken pieces of older rocks. According to the New World Encyclopedia sandstone is “formed from cemented grains that may be fragments of a pre-existing rock or crystals of a single mineral. The cements binding these grains together are typically calcite, clays and silica. Grain sizes in sands are in the range of 0.1 to 2 millimeters”. 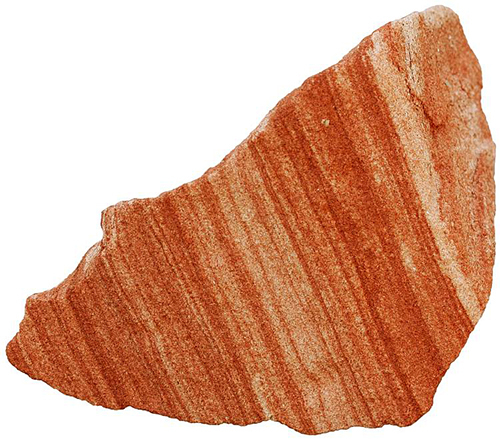 There are two principal stages in the formation of sandstone. In the first stage, a layer or layers of sand accumulate as the result of sedimentation caused by water or air. The New World Encyclopedia describes the second stage as the accumulated sand being compacted by pressure of overlying deposits and cemented by the precipitation of minerals within the pore spaces between sand grains. You're receiving this newsletter because you registered with us online or have a Dry-Treat Warranty.